What are those internal issues? Once you get beyond all the panting, it pretty much boils down to this: There are some moderate-to-conservative Democrats who don’t want to raise taxes on the wealthy, or at least not by as much as the president does. Also, these Democrats want to cut more from Social Security and Medicare than their more liberal colleagues do. What I’m at a loss to see is how this is remotely relevant to the negotiations. Obama is bargaining with the GOP leadership, after all, whose assent is necessary for any bill that passes the House and (probably) the Senate. It’s almost impossible to imagine a scenario in which he’s able to strike a deal with John Boehner and Mitch McConnell, but it can’t pass Congress because conservative Democrats defect. First, suppose Obama reaches a deal with the GOP to somewhat raise taxes and cut Medicare and Social Security spending prior to January 1, when the Bush tax cuts expire and over a trillion dollars of spending cuts start to kick in. But suppose also that a few conservative Democrats find these tax increases too big and the entitlement cuts too small. Well, so what? Between the GOP, whose leadership has just approved the deal, and more liberal Democrats, there will be more than enough votes to pass the necessary legislation. Now consider the alternative scenario, in which Obama and the GOP don’t reach a deal prior to January 1. At the point, everyone’s taxes will rise. Obama can then insist on a bill that cuts taxes on all but the top 2 percent of income-earners, his preferred position. It’s hard to imagine the GOP opposing a massive middle-class tax cut. If they don’t, then the position of a few conservative Democrats is once again irrelevant—the bill will pass the House and Senate. And if the GOP somehow decides to commit harakiri and oppose the middle-class tax cut, then the position of those conservative Democrats is equally irrelevant, since nothing is going to pass the House and therefore Congress without John Boehner’s imprimatur. Again, I’m failing to see the point of the Politico piece. The only way Democratic defections could matter is if they come from the left side of the party, not the right. For example, it’s possible to imagine Boehner, McConnell, and Obama agreeing to a deal that doesn’t raise rates by enough to appeal to liberal Democrats, and raises them too much for conservative Republicans to stomach. At that point, the deal would suffer defections from both the right and the left in the House and Senate, and would unravel. (This was in fact a major concern during the last round of deficit negotiations in 2011.) But, again, that would have nothing to do with dissatisfaction among conservative Democratic senators, which is the only sort of Democratic dissatisfaction the Politico piece really considers. Indeed, the whole piece is somewhat bizarrely written as a kind of warning to “unions and other progressive groups” to avoid overconfidence in their ability to influence a deal, when in fact they’re the only Democratic bloc that has any real leverage over its outcome. In the end, the notion that conservative Democrats (i.e., Democrats who want smaller tax increases and bigger entitlement cuts) must be listened to is nothing more than a bluff, one made with the same goal in mind as the other major bluff at work here—the idea that going over the fiscal cliff would instantly wreak disaster on the economy. As Jon Chait has explained, the whole point of such fiscal-cliff scare-mongering is to deprive Obama and the Democrats of the leverage they’ll abruptly gain on January 1st, which will enable them to strike a much better deal than Republicans and their allies in the deficit-industrial-complex want to give them. Likewise, the whole point of arguing that Democratic moderates must be reckoned with is to frighten liberals into making concessions no sane person with their bargaining power would agree to. 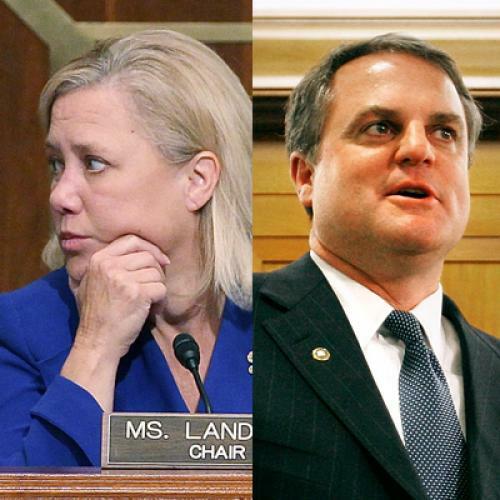 Of course, I’m not surprised that red-state Democrats like Mary Landrieu and Mark Pryor, who are quoted in the piece, would push this “heed the moderates” line. Or deficit-hawk groups like Third Way (also quoted). I am, however, a little surprised that Politico has run with this story so credulously.